The Bricks seemed like an interesting free UI design resource, so I proceeded to attempt download and then I hit a "Tweet to Unlock" wall. This irked me... the resource is not free if there is forced publicity to all my followers (before I actually get to try it) and I was not told about the terms of exchange until I arrived at the download decision (it being advertised as free extensively until that point). I would have been glad to register with the site to download the resource or possibly even paid for it. Am I just turning into a grumpy old man or is this a dark pattern? Is a "less-than-paid" but "more-than-free" distribution model a good user experience? Smells like the old "bait-and-switch". 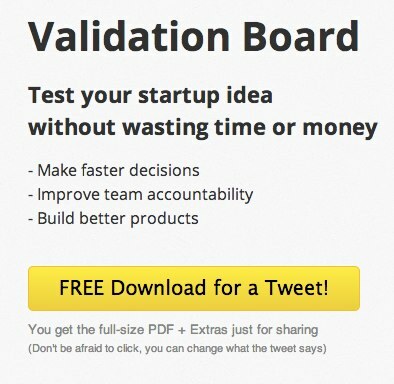 ValidationBoard.com has a nice pattern of the tweet to download that did not feel like a dark pattern at all... totally upfront, product was well explained and described, transaction worded respectfully. I clicked willingly. I'd say this isn't a dark pattern at all. The simplest definition of a Dark Pattern is design meant to trick people. Now, there can be good tricks too, so Dark Patterns are really about deceiving users into doing something that benefits your business goals but not them. There's no trickery here. 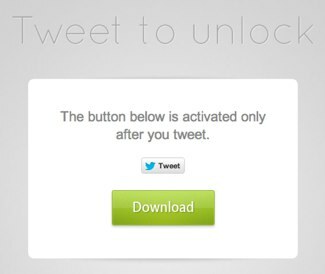 They clearly present what they want you to do (Tweet), how to do it (click the button) and why (to get my download). The business case reason is pretty clear implicitly (we want free advertising). Really this is sort of an inversion of the classic "click an ad and we'll let you in" model; instead of showing the user the add, you're getting them to show their friends an ad by their own free well. It's also important to note you can easily go and delete the ad-tweet right after downloading; I've done that myself. Cnet goes and tells you you need a "secure downloader"; sounds great, right? I hate malware. But in actuality they've wrapped the original installer in adware which presents you "special offers" and tries to install unrelated junk software while you install what you wanted. Worse, they've made the extra software opt out, as you'll note above the clear default option is accept; if you just click through the installer you'll find some unwanted new toolbars in your favorite browser. And of course Cnet gets paid for tricking users like this. That is a Dark Pattern. As I've said in a comment above; It's a dark pattern when it's too late to run. Sure, some people won't want to agree to these terms, but it's their choice. There are always terms people won't agree with; that's no different than people not wanting to pay $50 for something at a store. You know what you're getting. Dark Patterns mislead you, you don't know what you're getting until it's too late to opt out. That's why they're evil. But when you follow the link, then you find out it's not quite free - they want you to advertise their product. So it's a bait-and-switch. It advertises as if it is freeware, makes you psychologically commit by clicking onto "The Bricks" for more info. And then you find out that it's not freeware, it's a variant of ad-ware, where instead of them advertising at you, they want you to advertise them to your twitter followers. At this point, you may be psychologically committed, having come this far, but you're not physically committed - you can still just navigate elsewhere. However, if you really object, and if you're satisfied that you're not breaking any laws in your country, you could just download The Bricks directly, try it out, and if you don't like it, delete it. And if you do like it, well, you could always tweet about it. The actual download link isn't that hard to find. Use the source, Luke. I would not say it's a dark pattern. Isn't it their's to decide what they would like in return for their offering? If you think it's bad, why don't you tweet your anger and give them the bad publicity they 'ask' for? Or, if you really rather not have anyone read about your interest in the resource (which this entry here seems to contradict), you can still tweet, download and delete your tweet right afterwards. That said, I would say it is an unfortunate pattern, because I - still not knowing what the site offers at all - cannot seem so find out without tweeting about it up front. Which I can't be bothered to do right now. Well, it's the context that made you feel it's a dark pattern, what i would do, allow everyone to download everything, and ask nicely, "Would you please donate a tweet so more and more people could benefit"? Now if you allow me to download freely and show me this message afterwords, chances are 70-80% higher that i would tweet and still be happy, it makes me feel like i did help some, but in it's current context, i would just close that window and think "well, keep it you commercial old school dude"
Not the answer you're looking for? Browse other questions tagged social-media conversion dark-patterns or ask your own question.